One of Denmark’s largest concentrations of industrial companies outside Copenhagen is located in Kalundborg. Large energy and processing industrial companies and some pharma/medico and cleantech companies are based in this industrial area. Some of these companies are part of the internationally well-known Kalundborg Symbiosis. Kalundborg has built its local development strategy on being the “Green Manufacturing Municipality”. This is because Kalundborg is one of the few places in the country that has managed to maintain its manufacturing industry, which is the most important industry for the local economy. The network in Kalundborg has developed over the course of five decades. It began in 1961, when Statoil (then Esso) needed water for its refinery near Kalundborg. The first conduit pipes in the Kalundborg Symbiosis were laid between Statoil and the nearby lake, Tissø. In 1972, Statoil entered into an agreement with Gyproc, a local gypsum production enterprise, for the supply of excess gas from Statoil’s production to Gyproc. Gyproc used the gas (today, natural gas) to dry the plasterboard produced in their ovens. In the following year, 1973, Dong Energy (then the Asnæs Plant) was connected to the Statoil water pipe. Thus, what would later come to be known as the Kalundborg Symbiosis then had three partners. Over the years, more businesses were linked into the Kalundborg Symbiosis, and in 1989, the term “industrial symbiosis” was used to describe the collaboration for the first time. 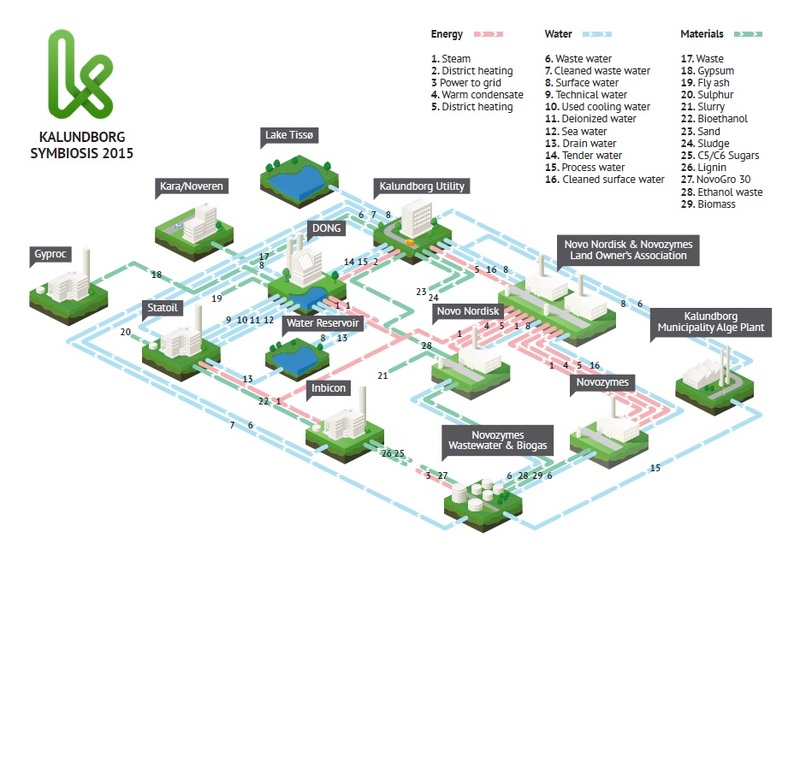 The Kalundborg Symbiosis now has eight private and public partners and involves approximately 50 symbiotic exchanges. The Kalundborg Symbiosis was developed based on commercial agreements between the partners. The early development of the network was based on the initiatives of the companies themselves, especially Statoil’s steps to find a solution for the water supply to its refinery. There are several industries located within a short distance, which made it feasible to install pipes for water and energy exchange. The companies are not key competitors with each other, which made mutual trust easier to gain. This trust was essential in the development of the network. The Symbiosis was ‘discovered’ in the early 1990s by local high school students, who identified and modelled the symbiotic exchanges in Kalundborg during a school assignment on sustainability. The international press and then academia picked up the story through the multinational companies involved in the Kalundborg Symbiosis. In the following years, the Symbiosis received increasing international attention from academia (especially Yale University) and practitioners wishing to work with industrial symbiosis. To manage the international delegations visiting the network in Kalundborg, the Symbiosis partners established a visitor service in 1996. Since 2010, the visitor service has become integral to the development department of Kalundborg Municipality. The Symbiosis partners established an association that provides funding for the visitor service. The organisation of the Symbiosis centre was developed with support from two projects co-financed by the European Regional Development Fund. Based on increased political will, the centre was renamed Symbiosis Center Denmark. Since 2015, Symbiosis Center Denmark has engaged in initiatives across the country to support the development of industrial symbiosis. The national centre has a mandate to work strategically in four key areas: developing symbioses between companies, training and education, branding and investment promotion, and collaboration with universities. Symbiosis Center Denmark collaborates in branding and investment promotion with the investment promo tion agencies, State of Green, Copenhagen Capacity and Invest in Denmark, which are interested in the potential for attracting investments based on Danish expertise. This involves attracting investments from the delegations who visit the Symbiosis Center Denmark to learn about the Kalundborg Symbiosis. The “Regional Growth and Development Strategy 2015– 2018” for the Zealand region underlines the development of industrial symbioses, with a particular focus on resource efficiency, as a tool to enhance the competitiveness of companies. Further regional development funds were granted for the establishment of the information centre, Symbiosis Center Denmark, in Kalundborg in December 2014. Developed in collaboration with 17 municipalities, the “Common Regional Climate Strategy 2015–2018” for the Zealand region also incorporates industrial symbiosis. One of the objectives of this strategy is “More renewable energy and better use of resources” and enhancing the development of industrial symbiosis between companies in the region is one of the ways in which this strategy should be implemented. Regional municipalities are showing increasing interest in this area, and some have started to employ “symbiosis employees” in their municipal environmental departments. This article is part of Nordregio News #1. 2016, read the entire issue here. What propels industrial symbiosis in the Kemi–Tornio region?